Friday was a historic day for Stony Brook Track and Field at the Fastrack National Invitational, as sophomore mid-distance runner Luke Coulter of the Men’s team broke the program record for the 800 meter race with a time of 1:52.44. Coulter, who finished first in the event at the Staten Island Ocean Breeze Track and Field Facility, qualified for the IC4A’s race with his run. 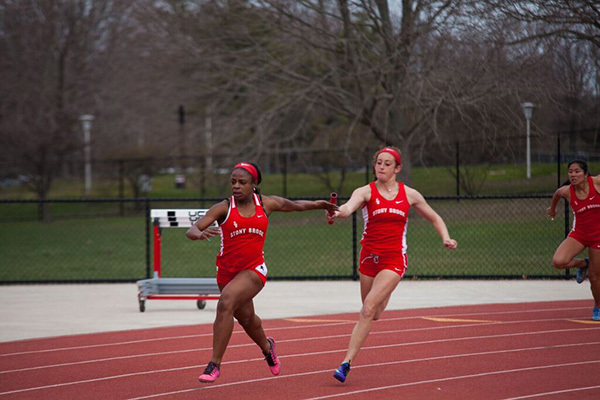 The team’s fifth meet of the 2019 season also featured senior sprinter Kevon White finishing first in the 400 meter dash with a time of 49.58. The trio of distance runners, senior Michael Watts, and juniors Vann Moffett and Cameron Avery, crossed the finish line second, third and eighth with times of 8:15.26, 8:17.24 and 8:23.29, respectively, in the 3000 meter race. Freshman distance runner Robert Becker finished fifth in the mile with a time of 4:14.81, while sprinters senior Shane Harris, junior Spencer Payton, sophomore Matthew Cappock and freshman Thomas Wilson finished sixth in the 4×400 relay with a time of 3:23.39. The Women’s team also had an impressive day, as distance runners junior Clodagh O’Reilly and freshman Klaire Klemens both qualified for the ECAC after finishing seventh and eighth in the mile run invite with times of 4:57.88 and 4:58.35 respectively. Senior sprinter Sarah Militano finished fourth and eighth in the 60 meter dash and 200 meter dash invite with times of 7.62 and 25.53. “Sarah Militano has impressed each week and continues to get better and better as we move towards the conference championships. Clodagh and Klaire had breakthrough runs over the mile, both breaking the 5 minute mark and qualifying for the ECAC for the first time, should be a big confidence booster to both ladies and open up the door to more of this level of performance,” Ronan said in a press release. Other strong performances from the Women’s team included sprinters senior Courtney Warden and junior Emmanuela Lauredent finishing fifth and seventh with times of 8.72 and 8.80 in the 60 meter hurdles. Junior Alyssa Oviasogie followed up her historic performance at the Metropolitan Championship by finishing third in the long jump with a marking of 5.33 meters. Senior sprinter Chinque Thompson finished sixth in the 60 meter dash with a time of 7.77. While Ronan remained enthusiastic about the teams’ recent performances, he also recognized the room for improvement and upcoming challenges the team will face. “But like every team, we still have a few athletes that need to get better in next two weeks if they are going to contribute at the AE meet,” Ronan said. The Seawolves next meet will be at the America East Championships Boston University on February 22-23.